See, I have this overflowing TBR list on Goodreads and it doesn't really seem to get any smaller, no many how many books I read a year. And it's grown a bit out of control actually. So I've been thinking of ways to keep track of the books that are on it. Back when I first had a Goodreads account, everything I had any interest in reading went on the to-read list and aside from the shelves 'read' and 'currently reading', that was pretty much as far as my categorization skills went at that moment. To be fair, it was a step up from the Word document I had before. Then I discovered the wonder that is adding your own shelves and now I have all different kinds, even one that lists all the series that I own all the books in but haven't started the first book yet from. I use Goodreads to keep track of the books I own, the books I own and haven't read yet, the ones I've ordered and pre-ordered and the ones I have received from Netgalley or Edelweiss for review. And this has been working pretty well for me so far. I also have a color-coded TBR list spreadsheet with where to find the books on it, whether I own them, can borrow them, have pre-ordered them, etc. It's not actually up to date at the moment as it consumes a crap ton of time to actually add everything to it and I've fallen so far behind now that it'll be a beast to do. But I do love to establish a little order in the chaos that is my TBR list and when I came across my friend Debby's posts about using spreadsheets to manage your yearly reading and book inventory and review copies and LOTS MORE, all my nerdy spreadsheet-loving senses were all tingly and I couldn't resist and made a digital review copy spreadsheet. AND I LOVE IT! It took up a lot of time, but I have now added all my digital galleys into a spreadsheet sorted by release date and it's heavenly. I don't have to scroll through several lists to see what I should be reading next, I just open up Excell and BAM there it is, complete with genre and publisher and everything. 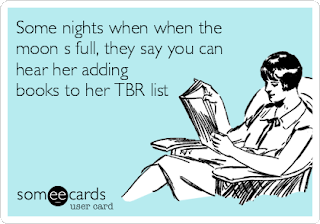 But what I really want to know: how do you keep track of the books on your TBR list? Any tips for me? Oh my gosh, I have no advice to give but I am mighty impressed by the use of spreadsheets. Wow! I just have an ridiculous goodreads shelf that makes me frustrated when I can't immediately find what I want! Wow! you are definitely well organised! I only have one huge to-read list on goodreads and it does take forever if I'm looking for that book I saw the other day (or month), but don't remember it's title or author! That is an impressive way to arrange TBR books. I keep wanting to (and needing to) organize my TBR list on goodreads. You mentioned Netgalley and Edelweiss, I have Netgalley, but is Edelweiss good for actual (not digital) copies of books to review? I have NO ORDER, lol. The books that are higher up on my TBR are review copies and books I've purchased. xD That's about it. I just...go with the flow, which probably doesn't work that well, but I don't care! There's order in my chaos. Wow. Your system is next level! I just have a big bag of books under my desk that I dig through whenever I need something to read. Or that I empty out when everything is due back at the library. Ha! I need to take my system to the next level. I use Goodreads and have created shelves to help me sort it but my biggest challenge is keeping track of when a book in an ongoing series comes out. For big name author's it's a bit easier but for the little guys I'm constantly forgetting. An excel sheet that I can sort by date is a great idea. My current list is 283 and going strong. I have a tab on my blog that goes to a list that I update, adding new ones and striking through ones that have been read (in alphabetical order). It's not fancy, but it gets the job done. I dream of doing a great spreadsheet that can take care of multiple listings and that I'd be able to edit and view different ways. Instead I have typed lists in binders, a card catalog of book lists, and sticky notes everywhere with the names of book lists. I just keep adding to them and slowly, ticking them off as I get them read. I have the exact same problem with my TBR shelf. Why does it never go down? I have over 1000 books on my TBR shelf. I already created a spreadsheet for things I've read, but I think I like the idea of having one for books I want to read as well. Hopefully that would keep things in better order! I can't keep track of all the books! Sweet honeysuckle, you sounds horribly organized. I tried. I really tried to be organized by after years of adding and subtracting and buying and listing, everything is a hot mess. I used to be just like you, but then I realized that I could make custom shelves on Goodreads! They had too much rhyme and reason at one point but then I whittled it down to make it work better for me. I especially like that I can have shelves separating books read in certain years, as well as books that were gifted to me. Oh, and all those freebie books from Amazon ... they have to have their own shelf, too! I'm sticking with the GoodReads and "I'll put my unread books on this shelf and read books on this shelf" in real life methods right now, but I know in the future things are sure to get more and more out of hand. Then again, I have a tendency to be obsessively organized so I have a feeling the hammer will come smacking down before these books have a chance to get out of line. I have some shelves on GR to keep track of certain books, but I'm not very organized. I spreadsheet would be a great idea but would be a daunting task to do at first. I live on Goodreads! I just pared down my TBR pile from 500 to 250ish and am just starting to use the make-your-own shelves option. The TBR pile will probably grow back to 500 over time, but hopefully once I get these 250 organized, I can keep it up when I add new books.